Blizzard has a new event running in World of Warcraft. Hallow's End started October 18th and runs through November 1st. 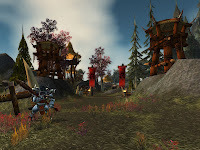 Read some of the details here at MMORPG Gate and click the link for the full story. Every year during Hallow's End, adventurers celebrate the time when the Forsaken broke away from the Scourge. Heroes for the Horde and Alliance can speak with any innkeeper and get a Treat Bag with a fun surprise inside! Open it as soon as you get it or else it will fade away. Be wary, though. The innkeepers are just as likely to trick you, changing your perspective on life. In addition to the innkeepers with their tricks and their Treat Bags, adventurers can purchase sweets from vendors in Orgrimmar and Ironforge. If candy isn't quite your thing, no problem! Every inn has a tub prepared for a game of Bobbing for Apples. Also, Jesper, an orphan in Stormwind, and Spoops, an orphan in Orgrimmar, are both sick and can't join in the Hallow's End festivities themselves. Brave adventurers can make these two children feel better by speaking with certain innkeepers and bringing the treats they give you back to the orphans as a gift. The Wickerman Festival, which takes place outside the Undercity every evening, promises fun for the Horde and the Alliance! For those interested more in tricks than treats, Darkcaller Yanka wants members of the Horde to throw stink bombs at the Alliance town of Southshore. Sergeant Hartman in Southshore encourages members of the Alliance to do their best to stop the Horde lest they be stuck cleaning up the stink! To get back at the Horde, he'll also ask you to crash the Wickerman Festival outside of the Undercity. Everyone is advised to sharpen their blades, tighten their girths, and prepare for battle!